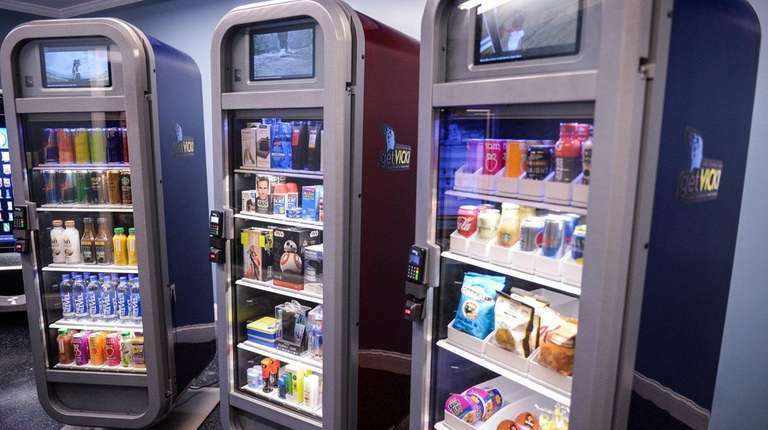 These are not your parents’ vending machines. Forget the image of feeding your cash into a machine and pulling out chips, cookies, pretzels or gummy bears. 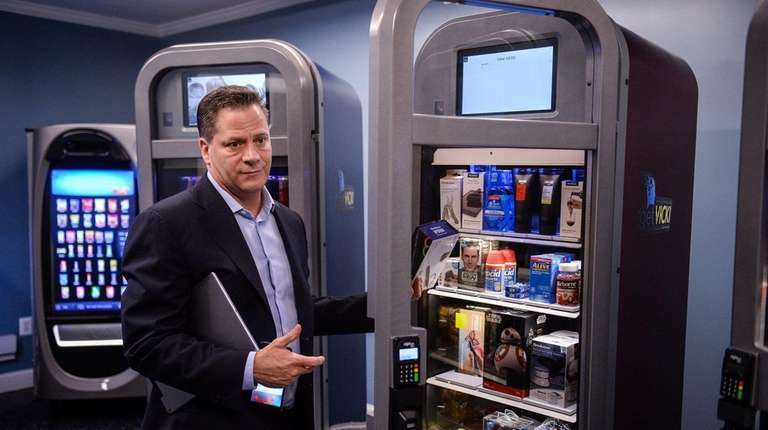 Two Long Island companies that manufacture vending machines have created high-tech models that can remember your name, ask you questions or invite you to play video games for prizes — and, in the process, collect and analyze data about how you shop. One of the new models features a touch-screen display, videos and games. 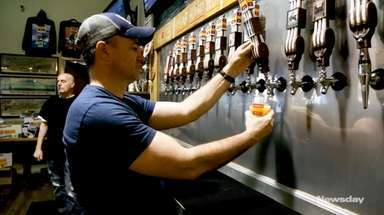 The other has shelves equipped with sensors that detect if items are picked up or put back, thumbprint and eye-scan technology, and the ability to talk and listen to consumers. Neither accepts cash; credit or debit cards and Apple Pay work. Vengo Labs, headquartered in Bethpage, and ViaTouch Media, based in Farmingdale, are using the machines to enter the “Big Data” ecosystem, following the paths of billion-dollar companies like Facebook and Google that collect and sell user data to help advertisers better target potential customers. Brian Shimmerlik, Brian Bofill and his son, Steven Bofill, founded Vengo Labs four years ago and developed the Vengo, a slim digital, wall-mountable machine that measures about 2 by 3 feet. 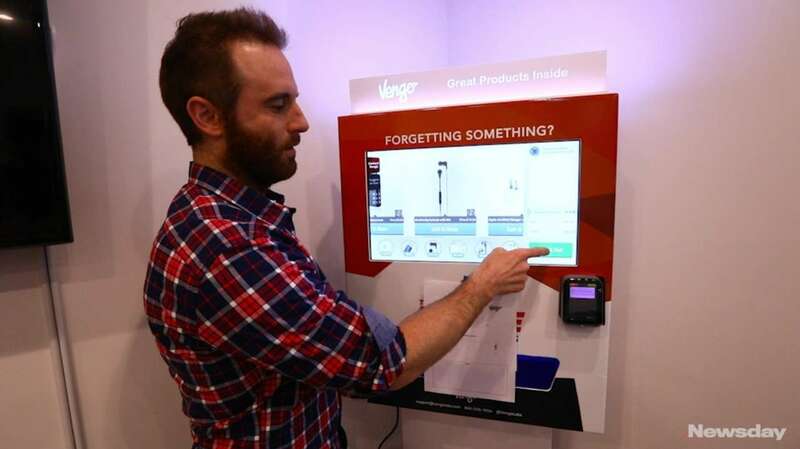 Vengo sells small items such as headphones, cellphone chargers and cosmetics using a touch screen. It uses games and rewards to entice consumers to register their information with the machine. Tom Murn, president and CEO of ViaTouch Media, has been in the vending business for 25 years, sharing ownership of other vending industry companies with his brother John. ViaTouch developed the VICKI (an acronym for the tongue-tying ViaTouch Intelishelf Cognitive Kinetic Interactions) machine. 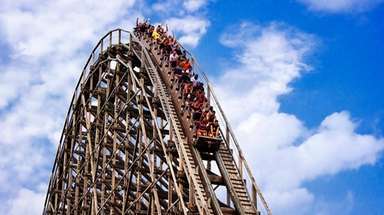 The machine will launch in August, and the company is accepting preorders. VICKI can sell a large variety of goods including food and beverages, cosmetics, over-the-counter medicines or movie memorabilia; its shelves sense when products and goods are picked up or returned, and consumers are billed electronically. Meanwhile, interactions with the products turn into valuable information for retailers. “This is a whole new revenue market,” he said, with the revenue coming from selling consumer data. That the humble vending machine has become a high-tech tool for gathering consumers’ information shows how deeply the business of data has revolutionized commerce. Armed with data about consumer behavior and past purchases, retailers are learning where to spend promotional dollars, said Jeff Orr, research director at ABI Research, a technology market intelligence company based in Oyster Bay. “Retail continues to evolve into a more personalized sales channel,” he said. For all the excitement about this new business, however, experts warn that consumers’ concerns about sharing their data — and rules about privacy — could pose obstacles. Thomas W. Shinick, an entrepreneurship and marketing expert and adjunct professor at Adelphi University’s Robert B. Willumstad School of Business, said most consumers are wary of how their information will be used. “What if I’m buying Tylenol from a vending machine three times a week, and the vending machine company is recording my purchases. If the business sells that data to, let’s say, a health insurance company, for example, will I now be profiled by the insurance company? Will the information they obtain about me affect my insurance policy?” Shinick said. Once a consumer has created a login, the machine can identify that person through thumbprint or eye-scan technology. When a person is identified by VICKI, the door of the vending machine unlocks and the consumer can select an item to buy. The person’s bank or credit card information, which was entered when the login was created, is billed when sensors on the shelves detect which item is picked up. The price of the item appears on VICKI’s screen. If the item is put back on the shelf, the consumer will not be charged. 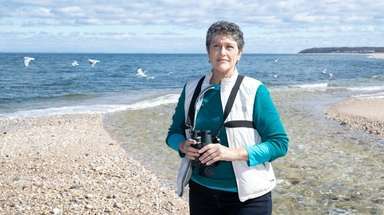 “When you pick up an item and put it back, VICKI can ask you, ‘Did you not like it?’ and you may reply ‘Yes, I did, but it costs more than I’m willing to pay for a bottle of water or a lipstick or whatever item it may be,’ ” Tom Murn said. What if a consumer doesn’t want to interact with VICKI? Companies that want access to data gathered by VICKI must pay a separate fee, which can range between $50 for one machine at one location to “hundreds of thousands” of dollars for a group of about 10,000 machines located on college campuses or in hospital systems, he said. Each VICKI machine, manufactured in California and assembled in Farmingdale, sells for $6,000, Murn said. The brothers own a traditional vending company and a vending machine manufacturer that had combined revenue of more than $50 million in 2016. Sales at ViaTouch have reached $30 million so far in 2017; 6,000 VICKI machines have been preordered. Murn projected that 60 percent of ViaTouch’s revenue will come from the new data gathering and reporting features. “We can take a look at the data and say, ‘This product is moving and this one is not’ and provide brands with detailed reports about their merchandise. For instance, we can tell them, ‘This item was in 100 machines and sold in 82 of them,” including the locations where they sold, he said. Retailers and brands receive this information instantaneously through mobile apps. “And if the consumer is in our ViaTouch network, meaning they’ve created a login, we can provide our clients with data that is even more detailed about the individual making those purchases,” he said. VICKI’s camera also produces “anonymous analytics” such as that a purchaser is a female “between the ages of 25 and 30 years old,” he said. There are legal restrictions on collecting consumer data, said Orr of ABI Research. Companies are prohibited from collecting information from minors in the United States, for instance. Some countries don’t allow the tracking of individuals on their mobile devices, and other markets may restrict the type of personally identifiable data that can be collected, he said. ViaTouch’s Murn said that his target market isn’t minors, and that he doesn’t think privacy concerns will resonate with millennials. Vengo’s Shimmerlik, 33, of Woodbury, said he was riding in a taxi late one night when inspiration struck. “I thought, ‘Oh my God! Snacks should be available to me right now. Why can’t there be a small vending machine in here?” he said. Eventually, Shimmerlik decided the real opportunity was to rethink and improve the traditional vending machine. He met Steven Bofill, 34, who has a background in mechanical engineering, and his father, Brian, 60, a former Northrop Grumman engineer, through mutual friends and started working on the concept machine in the Bofill family home in Bethpage, “right on the front porch,” Shimmerlik said. They secured $3.4 million in seed money from investors including rapper Nas, and an additional $2 million on ABC’s Shark Tank. 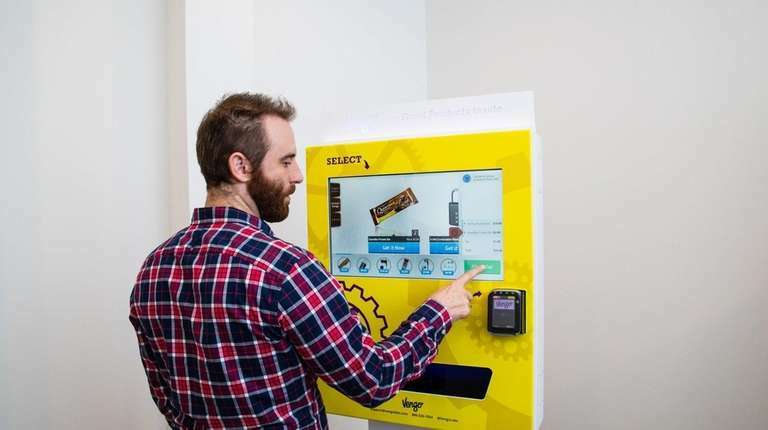 The Vengo features a touch-screen display, video, cloud based inventory monitoring (a network of servers storing data), the ability to sense and respond to foot traffic, and sensors that give refunds if a product is not dispensed. Vengos can now be found in more than 500 locations including college campuses, gyms and stores in 24 states, the younger Bofill said. Vengo machines are “magic” tools that draw customers in, Shimmerlik said. They engage consumers with videos — sometimes produced by the brands whose products are in the machine — and let them play games to win free products. Vengo partnered with Estée Lauder — the New York-based cosmetics giant that has a research and development operation in Melville — on a promotional campaign. A machine was placed alongside the company’s cosmetics counter at the Roosevelt Field Macy’s in Garden City. On Vengo’s screen, customers played a memory game where they were shown images of lipsticks and other make-up items, and asked to remember their location. Winners were prompted to enter an email or phone number to receive gifts: a sample-size Estée Lauder mascara and a coupon code to be redeemed at the counter. The key is to allow people to have fun and reach them through games and quizzes, Shimmerlik said. Consumers can share pictures of themselves on Facebook and Twitter that were taken by the machine. Vengo Labs charges retailers and brands a fee that allows them access to consumer data. “We control the data that is gathered but can share insights with brands,” Shimmerlik said. Each Vengo machine carries six products and sells for $3,100, plus a monthly $15 software fee. The company had revenue of $1.5 million in 2016, and sales are accelerating, Bofill said: “We’re about to hit that by the end of the month,” he said in March. CORRECTION: Tom Murn is the president and CEO of ViaTouch Media and owns other vending businesses with his brother John. 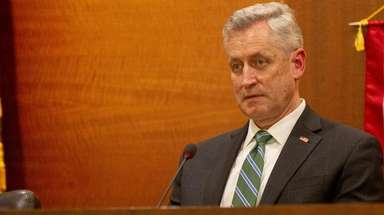 A prior version of the story misstated John’s relationship with ViaTouch.